Here is more information from a Media Release on this all-new innovative game for the older kids and crowd……. Now available at DropMix.com and in your local stores. PAWTUCKET, R.I.–(BUSINESS WIRE)– Hasbro, Inc. (NASDAQ: HAS), a global play and entertainment company, has opened pre-orders in the U.S. for the highly anticipated DROPMIX music-mixing game developed in collaboration with video game developer Harmonix Music Systems, Inc. DROPMIX uses cutting-edge technology to empower players to create unique mixes with their favorite hit songs by playing cards on a game board connected to a mobile app. Pre-orders for DROPMIX can be now be placed online at DropMix.com, with orders shipping September 24. DROPMIX is a first-of-its-kind competitive gaming experience that blends physical and digital play to give players a fresh way to combine their favorite artist and songs and discover new ones. When a DROPMIX Card is placed on a Mix Slot, the electronic DROPMIX Board immediately starts playing the corresponding part of the song (bass, beat, loop or vocals) noted on the card. The board reads up to five DROPMIX Cards at time, using NFC chip-enabled cards, and the proprietary software in the app seamlessly combines the music within each card to create a unique mix. Freestyle Mode: A solo play mode where players can build the ultimate mix picking any artists, genres or song parts. No rules – play any card in any slot! Players can save their mixes in the DROPMIX app and share them with friends at any time! Party Mode: A team-based game where players race against the clock to achieve the highest score by matching requests made via the DROPMIX app. Every request answered rewards points based on how quickly players place their cards down. Answer all the requests accurately to unlock a bonus round and push your score even higher. Clash Mode: A head-to-head competitive mode where players need to think strategically to dominate the mix. By carefully choosing and building decks, players can use different abilities to score points or block opponents as they race to be the first to reach 21 points. The DROPMIX Music Gaming System, which includes an electronic DROPMIX Board and 60 DROPMIX Cards across multiple music genres, will be available at major retailers and online on September 24 for the suggested retail price of $99.99. In addition to the 60 DROPMIX Cards in the Music Gaming System, Hasbro will release Playlist Packs with 16 DROPMIX Cards for the suggested retail price of $14.99 and Discover Packs with five DROPMIX Cards for the suggested retail price of $4.99. Additional cards will be rolling out on an ongoing basis to allow players to collect and curate custom decks and create new and unexpected soundtracks each time they play. Players must also download the DROPMIX app which will be free on the App Store for iPhone and iPad and on Google Play for Android devices. DROPMIX is a dynamic and fast-paced music-mixing game that uses powerful technology to give players a new way to create surprising music mixes while competing and connecting with friends. 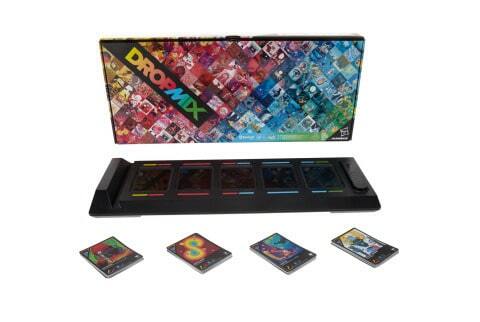 DROPMIX was developed as a collaboration between Hasbro and award-winning video game developer Harmonix. The game will be available at major retailers and online September 24, 2017. Playlist Packs and Discover Packs will also be available in September 2017. Find out more at: www.DROPMIX.com. Fans can stay up to date on the latest #DROPMIX news by following @DROPMIXgame on Twitter, Facebook, Instagram and Snapchat and at www.DROPMIX.com. Harmonix Music Systems, Inc., based in Boston, MA, and established in 1995, is the leading developer of groundbreaking music-oriented video games including Rock Band and Dance Central. Harmonix was founded to invent new ways for non-musicians to experience the unique joy that comes from making music and has pioneered music and rhythm gaming in the US. For more information, please visit www.harmonixmusic.com. ©2017 Hasbro, Inc. Hasbro and all related titles and logos are trademarks of Hasbro, Inc. ©2017 Harmonix Music Systems, Inc. DROPMIX, Harmonix and all related titles and logos are trademarks of Harmonix Music Systems, Inc. All rights reserved. All other marks are the property of their respective owners. Dropmix is rated for ages 16 an older and for one to four players. The game could be played by kids younger than 16 such as 14 or 15 as they will undoubtedly be familiar with the music, sometimes more than the parents. 🙂 You can also play with more than 4 people by making teams. The more the merrier in my books. In order to play you need access to a device that is Bluetooth enabled. You also download the Dropmix App in the Google Play Store or iOs Store depending on the device that you are using. Included in the Dropmix box is the Dropmix board, 60 Dropmix cards, and instructions on how to play. The only thing required is 4 “AA” batteries and an electronic device of your choice to get the fun started. You can expand your Dropmix by purchasing a Discover Pack or a Playlist Pack. We have a Series 2 Discover Pack that expands our Dropmix by adding another 30 cards to our gameplay. Dropmix is a game like I have never seen before. It is leading the pack in combining music and essentially an electronic board game all in one. The game is great for parties and undoubtedly will be a hit this coming holiday season for Christmas parties and New Year parties. After all, what is a party without great music and a fun game to play? I can see that Dropmix will be a hit among teenagers and adults alike. The gameplay will have you dancing, singing, laughing and having a great time. Best of all, there are the three ways to play the game; Party, Clash, Freestyle, so you can change it up to suit the crowd and the event. I am extremely excited to announce a giveaway for one Dropmix. This giveaway is open to residents of Canada over the age of 18 and where permitted by local laws to enter and win giveaways. Please ensure you read the full terms and conditions found at the bottom of the entry form. Disclosure: MomMomOnTheGo was provided product for the purpose of this review. As always, MomMomOnTheGo only supports companies, products, and services that she loves. Media Release provided by Hasbro Canada. Bruno Mars – 24K Magic is one of the songs. Push It by Salt ‘n Pepa! Gloria Gaynor I will survive! I see Salt-N-Pepa Push It!